Setting up a Stunt Bike and everything you need to know about Stunting!! Crash Cages - Also known as "Stunt Cages", or "Full Cages", or "Engine Protection Cages"... this should be the first piece of equipment purchased when learning how to stunt due to the fact that most drops will occur during the learning period of stunting. Crash Cages are generally an inexpensive form of insurance considering that it will protect the most important parts of the bike. Frame Sliders will not get the job done for a full time or even part time stunter. We have supplied our customers with many different brands of cages since our inception in 2004. We will never stock or sell a cage that we think is ineffective for any reason. There are cage manufacturers out there that have quality issues, fitment issues, and manufacturing time issues and we will not carry any of these in our shop. We stand by all of our cages so please shop with confidence. We get asked a lot "What is the best crash cage". There is not right answer. Different riders prefer different cages. We feature Racing 905 Crash Cages in our 'Best Selling Stunt Packages' because they were our original supplier and have stood the test of time. We also carry the popular Sick Innovations Crash Cages, ImpakTech Stunt Cages, and New Breed Stunt Cages. What is the difference between a Full Stunt Cage and a Street Cage (Race Rails)? Click Here! 12 Bar/Round Bar - Also known as a scrape bar or 12 Oclock Bar or Wheelie Bar. This is generally the 2nd piece of equipment needed to get your stunting career going. 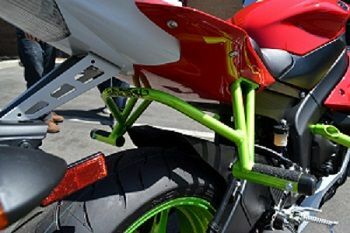 These bars attach to the subframe of the motorcycle and are used when 12ing the bike. These bars are meant to scrape the ground in place of the exhaust or tail section. Furthermore, with the introduction of the 12 bar came an array of bar tricks which all occur while the motorcycle is resting on the bar itself. These tricks include but are not limited to the ape hanger, watch tower, and various other acrobatics while the bike is on the bar. Only used by stunters wether just learning or pro stunting! What is the difference between a 12 Bar and a Round Bar? With a flat 12 bar, the bike can be stationary or moving and balance in the 12 o’clock position, allowing the rider to do aerial tricks, hang from the clip-ons, and even do burnouts on one wheel while parked in the 12 o’clock position. They also spark when they scrape the asphalt, which rates high on the crowd pleasing scale. A round wheelie bar has its own advantages, although it doesn’t allow for as many tricks. Round 12 bars hide under the tail better, allowing the bike to look more stock. They will also never catch the ground crooked and send your wheelie to the left or right almost instantly, which square 12 bars can do. Some riders simply cut their tails and ride without a 12 bar, completely removing the ability to scrape the ground during a wheelie at all. Most agree that square 12 bars are the most versatile and allow for the most appealing tricks. Rear Hand Brake Kits - After your bike is equipped with the basic safety equipment and sprockets, a handbrake kit is the next vital piece. A handbrake came onto the stunting scene much later and in actuality within recent years gained popularity. With the sport pushing its bounds into new territory came tricks that involved the rider in a position in which he cannot access the rear brake to control the balance point of the motorcycle. When tricks such as seat standers, highchairs, and spreaders came on the scene at first it was not necessary to use a handbrake, however these tricks quickly developed into scraping while in a highchair or spreader which involved the use of a hand mounted rear brake. Single Caliper Hand Brake Kits vs Dual Caliper Hand Brake Kits - Always a good debate and once again no right or wrong answer. For a starter, we always recommend our attractively priced Best Selling Dual Fitting Kit. 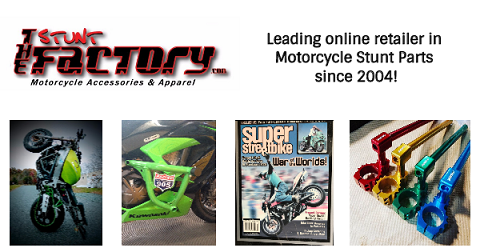 We have sold thousands upon thousands to our customers and riders over the years and they love them! The kit simply consists of a new Brembo Master Cylinder, an HEL Stainless Brake Line, and our Dual Fitting for your specific model. This kit will allow you to gain control of the rear brake with a left handed lever, while maintaining all the function of your foot pedal and rear caliper. 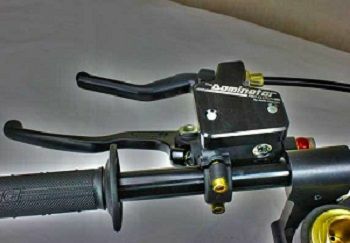 The optional ALL NEW optional Shorty Clutch Cap (Dominator Clutch Cap) installs on the top of the Hand Brake master cylinder and eliminates the stock, clutch perch and lever. This brings your levers closer together and allows for greater adjustability. The added features of the new Dominator clutch cap are: True Easy-pull Feel, Stronger more ergonomic lever, position adjustment on clutch lever, and choice of color. For the advanced stunters who feel they are ready for more braking power, our Dual Caliper Kits fit the need. 1. If you damage your hand master cylinder you still have got your foot brake. 2. If you break off your right foot bracket you still have your hand brake. 3. How often will you have a spare hand master cylinder with you? 4. Rear master cylinder adapter style hand brake set-ups aren't back up proof. If you mess up your hand master cylinder and air gets into your line you are left without rear brakes. This will not be the case when you are operating with a dual set-up bracket. 5. For competition riders two brake systems are better than one. Even professional riders occasionally break parts. In competition the judges aren't going to give you time to fix a brake problem, but if you're running a dual caliper set-up, then you have nothing to worry about. SubFrame Cages/Stunt Pegs - The last piece of our basics to stunting is the subcage. Subcages are very similar to crash cages but for protection of a different sort. While crash cages are protection for the frame itself and motor mounts, subcages focus on protecting the subframe of the motorcycle. Certain subcage applications will also eliminate the stock passenger pegs and relocate them to a different spot which is more becoming for staggered stance wheelies among other tricks. 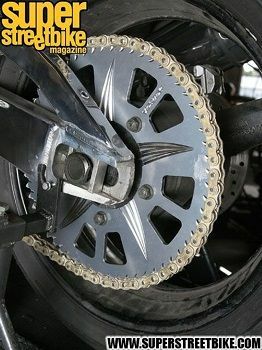 These pegs will in some cases be solid mounted to eliminate the possibility of them folding up on the rider when doing wheelies on the passenger pegs. 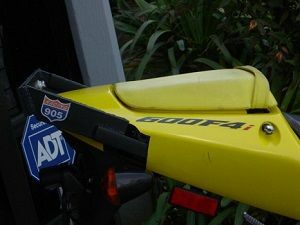 Stunt Stay - Meant to replace the upper stay on the motorcycle which usually holds the upper fairing and gauges in place. 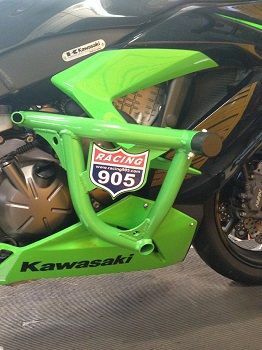 This is only necessary when running a full fairing bike and is meant in like fashion as both the subcage and crash cage to protect the front of the bike and provide increased stability for the front end of the motorcycle. This will not save the front fairing from damage. Please view our selection from Racing 905 Here! Basic Wheelie - Lifting the front of the motorcycle off the ground by means of either power or use of clutching the bike into a wheelie. There are many variations of the basic wheelie, some of which wil be listed below. Circle — A wheelie performed traveling entirely within a circle. "The Circle wheelie is the epitome of control on a motorcycle" -Matt Gorka (can also be combined with all other wheelie variations). 12 O'clock — Very high wheelie, past the normal balance point of the motorcycle. High Chair — Wheelie with the rider's legs over the handlebars. Tank Wheelie — Wheelie with the rider sitting on the tank with legs spread. Coaster — A wheelie that is balanced without the acting force of the motor i.e. with the clutch pulled in. The Wheelie is so far back beyond the balance point of the wheelie that the rider must constantly ride the rear brake to keep the wheelie from falling over backwards, effectively slowing down. A rider can pull in the clutch to create the effect of a wheelie with no engine noise. 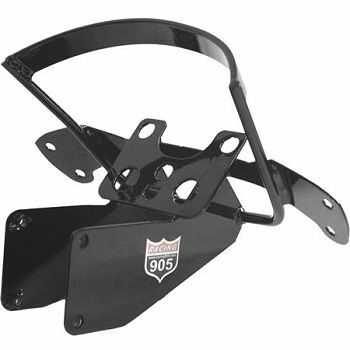 Conversely some riders will pull in the clutch and peg the engine on its rev-limiter, called a "rev-limiter coaster"
Seat Stander — Wheelie standing on the seat of the motorcycle. Ralph Loui — Circle Wheelie with the rider's Right foot on Left Peg. Watch Tower — Standing on the windshield riding with the bike at 12'oclock. Man-dom — Riding Wheelies with two men, possibly more. Burnout — Using the power of the engine and braking force to cause the rear wheel to spin, heating the rear tire and producing smoke. Suicide Burnout — Burnout with the rider dismounted and standing in front of the motorcycle. Chainsaw — An extreme form of Burnout performed by the stunter standing beside a motorcycle laying on its side holding the motorcycle exclusively by the right handle bar. Then causing the bike to "orbit" around the rider while maintaining control during the burnout. Merry -Go-Round Rider lays the bike on its side and climbs onto it. The rider then leans back on the bike while holding the throttle, causing the bike to spin round while doing a burnout. We cannot recommend or condone the use of any parts we sell for use in any illegal riding or behavior. That any stunts referenced are performed by professionals on closed courses under supervision of safety personnel and should not be attempted or recreated by you under any other conditions but the same. And in doing so you solely assume all responsibility for damage or destruction to yourself, your property, or the property of others. By purchasing any parts from us you agree to these terms and statements.